The only two living northern white rhinos left in the world, Fatu (left) and Najin (right). With the death of the last male northern white rhino last week, the world was reminded that yet another charismatic animal is functionally extinct because of humans. But in the future, because of synthetic biology, extinction may not be forever. And the northern white rhino could be the animal that pioneers a suite of new technologies that get us there. That’s thanks to an international team of scientists at the San Diego Zoo, the Leibniz Institute for Zoo and Wildlife Research in Berlin, and elsewhere, who are spearheading an ambitious plan to resurrect the northern white rhino using stem cells and assisted reproductive technologies. According to Oliver Ryder, a geneticist at San Diego Zoo and one of the lead scientists behind the effort, “a lot of progress” has been made since the plan was widely publicized a few years back. But that doesn’t mean baby northern white rhinos are right around the corner. The plan Ryder and others have articulated basically entails turning northern white rhino cells, housed at the San Diego Zoo and elsewhere, into animals. For starting material, the scientists have frozen sperm from a handful of deceased males. 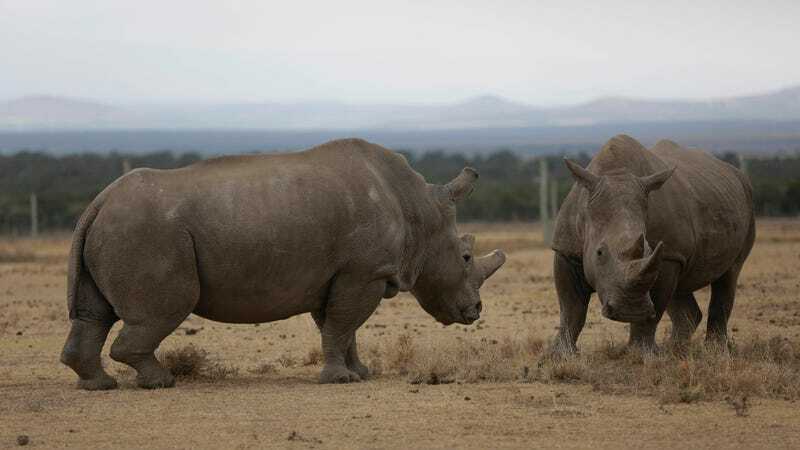 They’ve got Fatu and Najin, the two surviving females housed at Kenya’s Ol Pejeta Conservancy, who cannot bear young but can (in theory) become egg donors. And they’ve got live tissue cultures from a roughly dozen individual rhinos that they hope to transform into pluripotent stem cells, and from there, into more sperm and eggs. Ultimately, researchers hope to use these cells to create northern white rhino embryos in the lab, which can then be implanted in surrogate mothers—ideally, females of the southern white rhino, a closely-related subspecies. Although assisted reproductive technologies like in vitro fertilization are by now well-established in humans, suffice to say that doing something similar for rhinos would be unique. Manipulating stem cells in an endangered species is also highly unusual. The pieces are slowly coming together. An early step is to map out the genome of the northern white rhino to clarify how distinct it is from the southern white. This work is underway, with multiple individual genomes now sequenced. Excitingly, DNA sequencing has revealed a high level of genetic diversity within the last northern whites—“as much or more” than what is contained in the entire 20,000-strong population of southern white rhinos, according to Barbara Durant, a biologist at the San Diego Zoo who is leading assisted reproduction efforts for the project. “We cannot afford—the white rhino as a whole cannot afford—to lose that genetic diversity,” Durant told Earther. Work is also proceeding apace to transform cells from rhino tissue cultures into gametes, aka sperm and eggs. Ryder’s colleagues have already accomplished step one, demonstrating a method for creating northern white rhino stem cells from other tissues. They’ve even transformed some of those stem cells into beating cardiomyocytes, or heart tissue. If everything goes well, Ryder says he thinks his team could have gametes from stem cells “in a few years.” Then there’s the whole matter of mixing those gametes into embryos, and implanting the embryos in surrogate rhino moms, which is where the work of Durant and others comes in. Durant’s team is currently working to develop and refine a range of assisted reproductive technologies for rhinos, including artificial insemination, ovum pickup (collecting eggs from ovaries, not an easy task in rhinos where they are tucked many feet inside the body), and intracytoplasmic sperm injection, in which a single sperm is injected directly into an egg to fertilize it. This is basically a much more frugal version of in vitro fertilization, where tens of thousands of sperm are used to fertilize an egg. Eventually, Durant and her colleagues hope to impregnate six female southern white rhinos housed at the San Diego Zoo using artificial insemination, creating “proven females” that could, down the line, become surrogate moms for baby northern white embryos mixed up in the lab. “It’s gonna be a long road,” she said. Durant admitted there’s the concern that the public will lose interest in the effort to save the northern white rhino, which is likely to stretch out over decades and has been criticized by some as a distraction from the important work of preserving rhino habitat and tackling the poaching crisis, which led to the demise of the northern white. But she and Ryder both see the project as transcending one particular subspecies. After all, if the techniques they’re developing prove viable, it could open the door to a complementary set of conservation strategies for rescuing other endangered rhinos and other species on the brink of extinction. “I think we can show the power of science in conservation, and this is gonna be useful for all species,” Durant said. Ellis added that it’s “improbable” the technology will be perfected before the last two northern white rhinos are gone, and that the same may be true for other species on the brink, which is why it’s essential to preserve tissue samples while we can. “I think we all agree that we have to preserve genetic material so that when the technologies are available they can be used for conservation,” she said. At the same time, Ellis emphasized that we need to be protecting living rhinos in their native habitat, and working to stop the illegal trade in their horns. Rather than competing for conservation dollars, she sees the two approaches as complementary, acknowledging a sobering reality—species are going extinct far faster than we can save them. “We’re at the point with not just rhinos but other wildlife where we have to explore every option,” she said.